Merry Christmas to all! We all got a surprise stomach bug this week! Merry Christmas to us. Thankfully, we've still had a happy holiday season. Here's a little clip of our kids singing a few Christmas songs. Plus, a little blooper reel. Hope the rest of your season is so very merry! Hey Friends! We find out the gender of our babies today. Becuase they're identical, they'll either be 2 boys or 2 girls. Check out this lil clip to see what everyone at our house is guessing! It's funny how keeping things simple can make a girl so happy, but that's just what I did with Lila's Christmas dress and it was a huge hit. Mainly because it passed the spinning test. 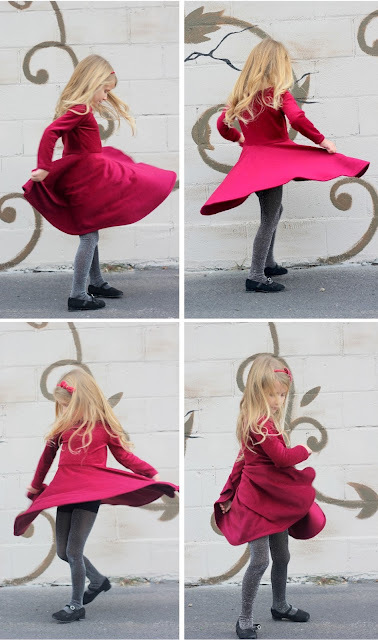 Because when you're 6, what's better than a dress that spins? I modified one of my favorite patterns (Pretty in Peplum by Sew Much Ado) by simply increasing the length of the the "peplum" to be a dress size. Very simple for a Christmas dress, but I wanted the velvety wine colored fabric (old, from my stash) to speak for itself and it couldn't have turned out better. I think it's been especially fun to see our kids get excited about Christmas. Lila has a lot to do with this. The oldest child really sets the tone and Lila is such a party loving girl, that it's fun to see her teach her siblings how to get excited for the holidays. The other day, we were wrapping presents and Lila kept smiling saying, "I just feel this warm feeling inside, Mom. I'm happy doing this, and these aren't even presents for me!" And that's when I got to explain the magic of giving to Lila. We feel happy when we give away freely. Those are the kind of moments that I hold onto as a Mom. Because all the the presents, parties, and Santa--it's all so fun. And I love watching my kids get excited about presents that they might get and parties they get to go to, but in the end, what I care about, is that they recognize the special feeling that comes with giving away. It's what this season is really about. Because the Savior gave us His life freely, we have the chance to become like Him. I can't think of a better gift. For the next little while, I'll be shifting gears, and sharing lots more about life with the twins coming our way, but until then, Merry Christmas, friends! Hope you have a wonderful holiday! We got a new tree this year. I am all about fake...ahem, artificial trees. :) I think real trees can be beautiful, but I just don't have the patience. Even when I was little and my Dad would get a real tree, I just remember thinking, "It would be awesome if we could have a tree that didn't shed, or have to be watered, or strung with lights." Lo and behold, the next year, my parents got their first "fakey" and I have been on board ever since. :) Anyway, after 8 years of marriage and 3 years of browsing Christmas tree's, we made the plunge and got an actual fluffy tree that doesn't look plastic. We let the kids have our old one. Because we're so generous with that old $30 tree. wink wink. It's been fun to see the kids be excited to decorate it though and what's more cozy at Christmas than twinkle lights on a tree? It warms the soul. I loved this recent talk about light at Christmas. I guess I never put two and two together about all the symbolic light we see at Christmastime. What a happy thing! Suddenly, I'm noticing all the lights on tree's, on houses, and even candles on the table and thinking to thinking of the light Christ can bring into our lives, even when things get tough. I'm so thankful for that reminder. Hope your Christmastime is so merry and bright! The other day, I was pulling out Christmas decorations and Madelyn found an old bag of coal at the bottom of the bin. It was a candy bag that Superman had gotten years before and I'm not sure why we haven't thrown it out. Ew, right? Madelyn asked, "Mommy, what's this? Is it candy?" Not wanting to open up 10 year old chocolate candy coal, I quickly responded, "Oh that's icky coal. It's what you get at Christmas if you're naughty and bad." Madelyn sat thoughtfully for a minute then said, "I'm vawwy naughty. Can I have some?" That child doesn't miss a trick. But what she said got me thinking about how sometimes we are naughty, even when we know better. I have and do make so many silly little mistakes in my life and sometimes I care and want to change and sometimes, darn it, I just want the candy. I'm grateful though, that no matter what my mood is (and believe me, being pregnant with twins has produced a myriad of moods) I have a Savior who loves me and is willing to help me become better. This Christmas, I've been thinking about the Star of Bethlehem and what I can do to better follow it in hopes that it will help lead me to be more Christlike. I think I'm always hoping that between all my pregnant mood swings, I'm teaching my kids to love and serve. And that through me, they might be able to see the love that Christ has for them. In the end though, they're the one's who teach me and show me what it really means to follow Christ. I'm a lucky mama to have them. I can't even tell you how frustrated I was when I cut his dress out and realized that I cut the tunic option, not the dress option of the First Day Dress. Just one of those palm to forehead moments. But I tried to make due and make a drop waist sorta thing. The velvety fabric wasn't majorly forgiving, but oh well. It's not exactly what I was envision, but at this point in my pregnancy, if I actually finish sewing something, it's a happy day and this baby has no choice but to wear it. I listened to this Christmas talk on Sunday and I just loved it. My sister-in-law made us this little "Come Let Us Adore Him" sign and I appreciate the reminder. Sophia also find the sign interesting. For different reasons, of course. Anything that she can pick up, lift, and carry around is the best thing ever. This has been such a happy Christmas season for us, we can't wait to find out the gender of our babies in a couple weeks. So much to be thankful for!